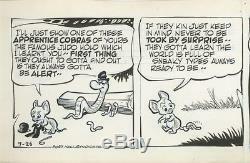 Pogo by Walt Kelly Two (2) Consecutive Original Strips! Published on July 25th and 26th, 1955. 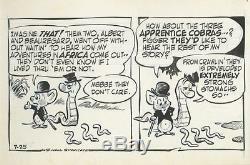 Mouse and Snavely and three Worms! 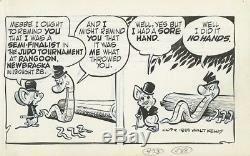 T he art is hand inked and signed by Walt Kelly. In very good condition, with an overall slight yellowing, mostly on the edges that is not too apparent under matte and glass. The original blue pencil line is evident. There are the usual pin holes where Kelly pined it while inking. They were originally folded between the center panels, which is hard to see when under glass. Thanks for considering this great artwork! 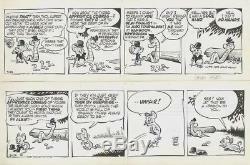 The item "Pogo by Walt Kelly Original Daily Comic Strips (2) 7/25, 7/26 1955" is in sale since Wednesday, November 15, 2017. 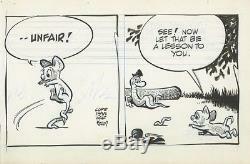 This item is in the category "Collectibles\Comics\Original Comic Art\Comic Strip Art". The seller is "picassotrader" and is located in Santa Rosa, California. This item can be shipped worldwide.